Two captive elephants blast air through their trunks to grasp hard-to-reach food, suggests an initial study published today in Springer's journal Animal Cognition. This behaviour, studied in a zoo population of Asian elephants (Elephas maximus), is altered according to the distance to the food, which may indicate advanced mental ability and awareness of their physical environment. 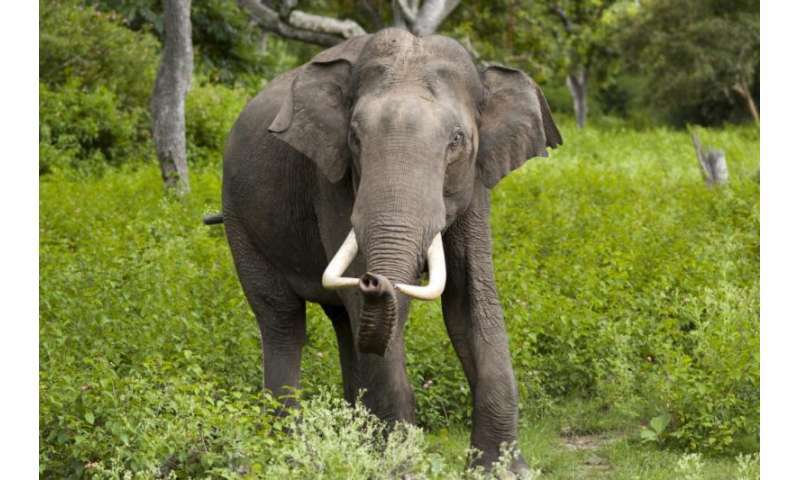 Previous observations, including by Charles Darwin, have suggested that elephants may manipulate their breath to reach inaccessible food, but there has been limited opportunity to test this behaviour in an experimental setting. To investigate whether elephants use this behaviour to achieve goals, scientists from SOKENDAI (The Graduate University for advanced studies) and Kyoto University studied two female captive elephants, Mineko and Suzuko, at Kamine Zoo in Japan. They predicted that the further away a piece of food was, the more frequently the elephants would blast it with air to bring it near to them. To test this theory, the team of researchers digitally mapped out a grid in a ditch in the elephants' enclosure, placed food in various locations on the 'virtual' grid, and filmed the elephants trying to reach it. They used five different types of food: apple, bamboo, hay, fallen leaves and potatoes. The researchers recorded the elephants' behaviour over 32 days, spilt into 128 trials; a trial began when it was audible that the elephants had started blowing and finished when they grasped the food or gave up. They then analysed the frequency and duration of blowing, the position and shape of the elephants' trunks, and their success and skill by tracking the movement of food across the grid. Their results reveal that on average it took three blasts of air for the elephants to reach inaccessible food and they were less likely to exhibit this behaviour if food was nearby. Mineko, the dominant female, was more proficient, particularly when it came to adjusting the position of her trunk to target the air at a specific point on the food to push it in the right direction. Lead author, Kaori Mizuno, said: "By blowing air through their trunks to obtain inaccessible food, the elephants appear to exhibit an advanced understanding of their physical environment. Their skills to manipulate air might be related to those elephants commonly use, such as blowing for self-comfort and acoustic communication"
The authors discuss whether, by using it in this manner, an elephant's breath could be defined as a 'tool', like the sticks used by chimpanzee to catch ants. They conclude that their study offers an opportunity to critically rethink the definition of a 'tool', focusing on the psychological process behind problem-solving behaviour, rather than the use of a physical object.